Theme trees are a great excuse to collect more ornaments. That is SO the case for my "space" tree. 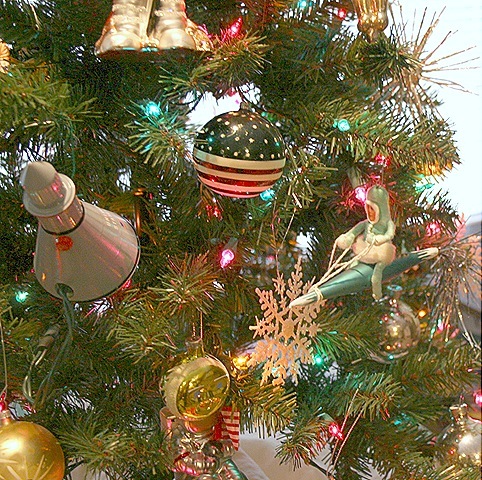 I came up with the idea for a space tree a few years ago when Hallmark put out a series of collectible ornaments commemorating certain events in NASA history. MrPeachez and I were young kids when Neil Armstrong stepped onto the moon and MrPeachez still enjoys his Tang to this day. It's just coincidence that we live next door to NASA Langley. Every year I try to add one new space/NASA related ornament to this tree. This year I added a spun cotton ornament by Vintage By Crystal. Can you spot him there riding on his little rocket? I've got stars, stars and stripes, astronauts and cosmonauts. One of my most special vintage ornaments is on this tree. It's Italian and it's the Man on the Moon. See him there on the left. I found him at an estate sale in New Jersey. I must say I sure did find a lot of treasures during my time spent living near the Jersey shore. That is such a cute tree! I love to do theme tree also. I spotted you little new guy right off! Space” tree but it’s really pretty and you have so many ornaments on it. I noticed that rocket man/woman immediately. It’s so cute with it’s little astronaut all in fur? Spun sugar? Not really. Spun sugar? I must be on overload 10 days before Christmas. I didn’t mean spun sugar. I meant spun cotton.I don’t know what “spun cotton” is, but at least I got the right name for it this time. Good grief…. LOVE IT!!!!! I am enjoying my ride through Christmas decorating at your house. Simply beautiful. Makes me want a Space Stick! I’ve been waiting to see this tree! 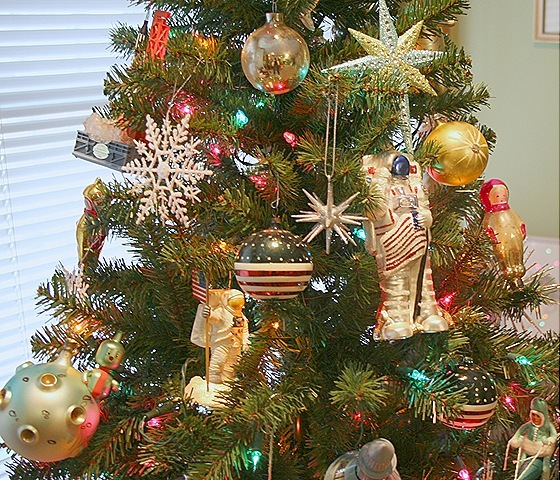 What an unusual but very cute theme for this tree, Suzy! You are so creative. You know you’re good when you can find vintage decorations the guys like, and you my friend are very, very good. Your tree is one of the most unique I’ve ever seen! I’ve always loved vintage images of spacemen and robots and such. 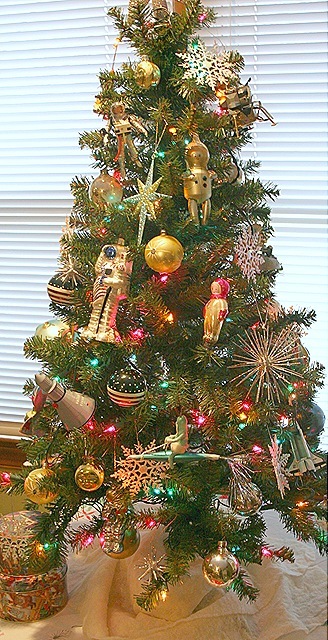 I never would have thought that one could decorate a Christmas tree in a space theme. What a darling tree and such a fun collection! Merry Christmas! It’s so beautiful. A great-themed Christmas tree! I love this Space Tree. I and my family have lived within 15 miles of Kennedy Space Ctr. since 1964. Both hubby and son were/are employed there. It has been such an exciting life here. I, too, have many of these same space oriented ornaments, and highlight them each year on our tree. Thank you for remembering and honoring our wonderful Space Program ! We are so proud of America’s accomplishments !